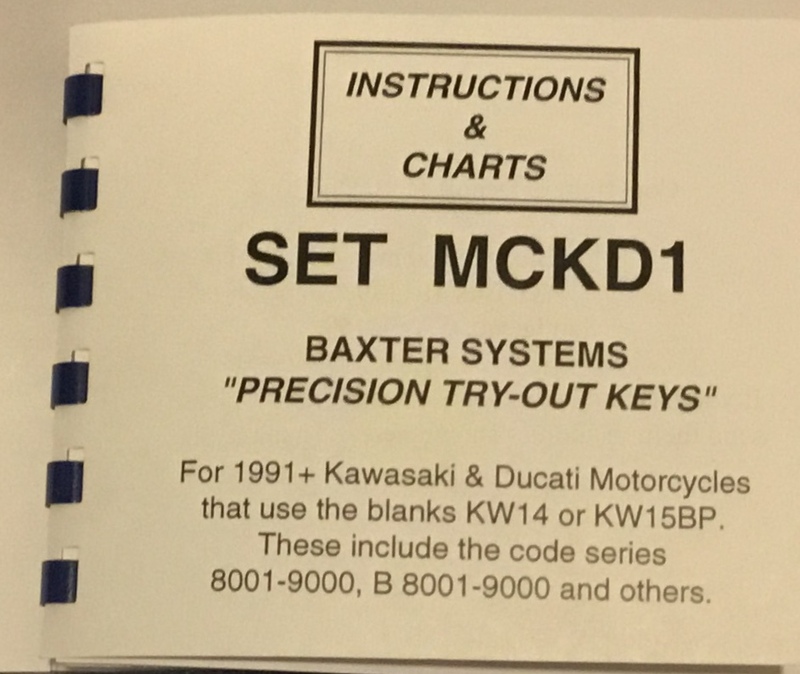 Baxter Systems has been making the best tryout keys, guide keys and code books for over 60 years! Sadly, in December 2017, Dennis Baxter has retired, and shut down all production. We did buy out all remaining stock. Once stock is exhausted, we don't expect to be able to get any more in. The tryout keys are made to the highest quality, all keys are numbered, on a great chain ring to keep them together and come with a sturdy storage box with detailed instructions. Note: On most double sided sets, there are two combinations on each key! Get the best, get Baxter! Sets 26a, 37, 42a, 61a, 64a, 66a, 75a, 82FB, 85, 90, 94, 96, 97, 99, 100, 106, 107, 110 and 111 are no longer available. Others sets may not be produced after current stock is exhausted. Set 100A - tryout set for utility locks, 5 space, 5 depth. T-handles, office furniture, etc Y11 key. Set 101 - tryout set for utility locks, 5 space, 4 depth. T-handles, office furniture, etc Y13 key. Set 101A - tryout set for utility locks, 5 space, 5 depth. T-handles, office furniture, etc Y13 key. Set 102 - new All-In-One set for Ford 10 cut locks. Set 104 - Hyundai Accent (1995-1999) using X235 key. Set 108 - All-In-One tryout set for Ford 8 cut locks. 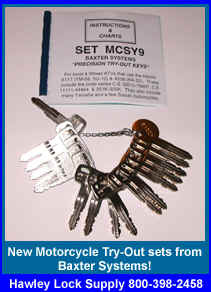 Sale: Set 70 - tryout set for most common Datsun/Subaru using X6 key. Sale: Set 71 - tryout set for most common Datsun/Subaru using X7 key. Sale: Set 75a - tryout set for Saturn. Sale: Set 76A - tryout set for Chevy Cavalier/Alphatech ignitions. Sale: Set 77A - tryout set for all GM 6 cut locks, including VATS. Sale: Set 84B - tryout set for double sided Chryslers 93-97. Sale: Set 86 - door tryout set for GM 10 cut doors and trunks, wafer pos 6-10. Sale: Set 89 - door tryout set for GM 10 cut doors and trunks, wafer pos 3-7.